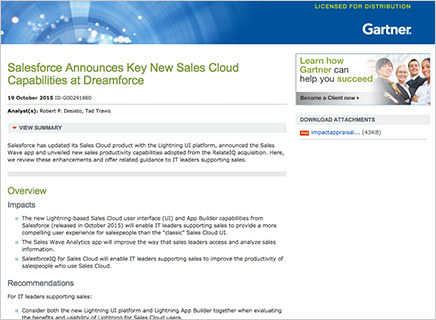 Gartner Report: Salesforce announces key new Sales Cloud capabilities at Dreamforce. The Gartner Report(s) described herein (the "Gartner Report(s)") represent(s) data, research opinion or viewpoints published, as part of a syndicated subscription service, by Gartner, Inc. ("Gartner"), and are not representations of fact. Each Gartner Report speaks as of its original publication date (and not as of the date of this Prospectus) and the opinions expressed in the Gartner Report(s) are subject to change without notice.